"I think that I would like to have Calvin as a friend, because he comes up with cool experiments, and I do too. I think that we would be good friends together and he could help me with my schematics for my doomsday machine because he is so smart." 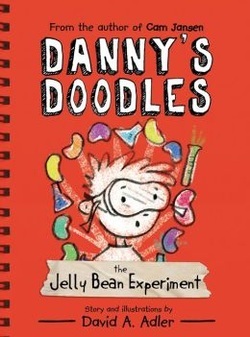 -Xan Chapman, age 10, on David Adler's latest book , "Danny's Doodles: The Jelly Bean Experiment." David Adler's newest hero, Danny Cohen becomes the almost unwitting foil for Calvin Waffle, a kid who seems to pull unusual ideas from a vantage point that Danny and his friends struggle to understand. As parents and peers get involved, they find that Calvin's differences can be his strengths. By the end of this sweet treat of book, Calvin finds situations where he can shine and Danny discovers the value of accepting people as they are. Calvin was a refreshing character that I could relate to, as he reminded me of Xan and his curiosity about things. THe fact that Calvin came up with a clever experiment that gave him information that might lead to what he truly wanted, (Friends) was magnificent. How many people would think that the sweet scent might make people want to get closer to you? But as Calvin displays his talents of observation, he puts together his own conclusion as to the outcome of his experiment, and this gives him the inspriation to make JBP. Inspriation is something that drives a kid like Calvin. As a parent of a child on the ASD spectrum, I found that Calvin was quite relatable, as did my son Xan. He and I read this book as part of his homework assignments to read 20 minutes each day. Xan's eyes lit up the more he read about Calvin. I related well to Calvin's mother, as I also have Aspergers Syndrome, and no two of us are aline, but boy, did I see a LOT of similarities between she and I and the way she is with Calvon and her interaction with people. She has no difficulty as an adult chatting with people to the point where we can make them wish we would be silent But we offer a lot of factoids, and she and Calvin work well together. I enjoyed how Danny seemed to understand a little better, having met Calvin's Mom, and seeing that perhaps the reason that he is so Calvin-esque may have a lot to do withhis Mother. I also felt that the respect he showed for Calvin when he found out the truth about his father was a kindness that not many children would understand, because he may embarrass Calvin. It was nice to see the two families interact at the ball game and become friends which seems to be something that not only Calvin needed, but his mother as well. My whole take on the book is that they really should include this in the school libraries or scholastic book sales. The children that Xander goes to school with are learning new things every day, as my son has his little developing quirks. THIS may actually give them a sense of understanding. That there are children that are out there, that are a little different, but that is ok. Sometimes they can do odd and silly things, but the world would be a boring place if we were all the same. Calvin is a great kid, and he copes well with his differences, and in a way, he becomes the super hero to others that he knew he was all along.